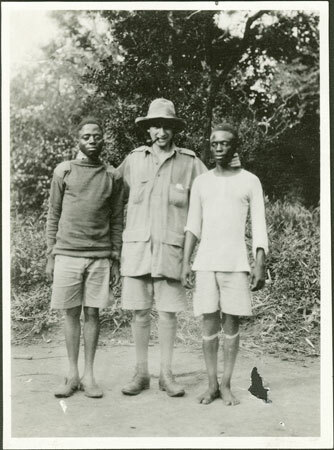 A group portrait with Evans-Pritchard in the centre, with his hands holding the necks of his servant Mekana (left) and Kamanga, described as his cook and house-boy. According to Evans-Pritchard both were sons of courtiers and therefore members of the Zande elite. Kamanga became a binza or witchdoctor initiate as Evans-Pritchard attempted to gain more information about the witchdoctor corporation. Notes on print/mount - "+65 46 EPA 468"
Notes on card mount m/s pencil - "hole l.rh, scuff l.lh, tear u.lh 6/87"
Morton, Chris. "Evans-Pritchard with Mekana and Kamanga" Southern Sudan Project (in development). 03 Jan. 2006. Pitt Rivers Museum. <http://southernsudan.prm.ox.ac.uk/details/1998.341.468.2/>.